Thank you for your continuous support of #SaveArtSpace, we can't do it without you! Learn more about our upcoming Public Art Exhibitions and local community events. Support Public Art in our local communities by joining SaveArtSpace for our April Fundraiser at Bushwick Community Darkroom, located at 110 Troutman St., Brooklyn, NY 11206. Enjoy wine while discussing public art and community relations with community leaders, artists and patrons. 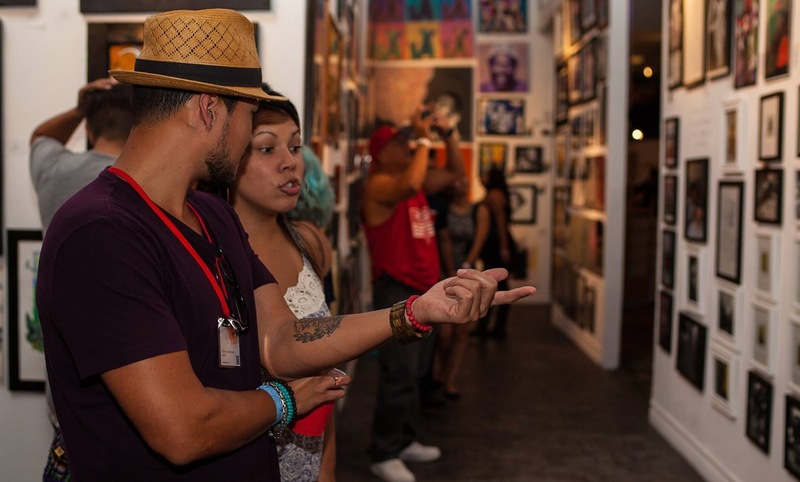 See the numerous art works displayed throughout the Bushwick Community Darkroom. Also learn about our upcoming open calls for art. We are seeking volunteers for our Spring and Summer Events. 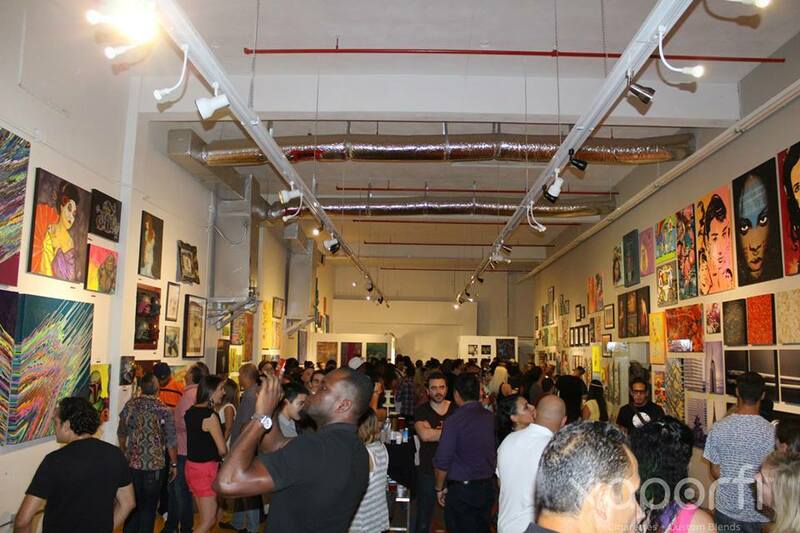 Volunteers are an essential part of SaveArtSpace's success. As a volunteer, you can spread the word online and in your local community, get hands-on experience in our programing and exhibitions, and help us raise vital funds for more art in our local communities. Wherever you live and whatever your lifestyle, there's a way for you to get involved. Showcasing Local Female Artists On Advertising Spaces Throughout NYC Beginning June 26, 2017. As An Arts Organization, We Feel That It Is Our Duty To Align And Ally With The Broader Artistic Community To Create Exhibitions That Address Intersectional Concerns Which Can Spread A Message Of Progressive And Positive Social Change And Empowerment. #SAVEARTSPACE Will Be Transforming Advertising Spaces Into Public Art In Local Communities Across America! 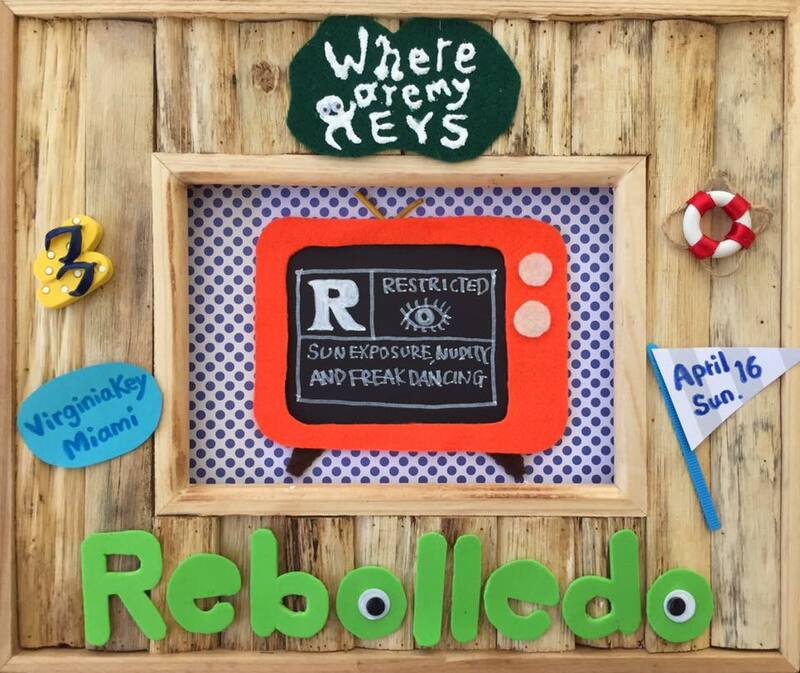 All Artists Nationwide (Including Puerto Rico And US Territories) Are Encouraged To Submit! 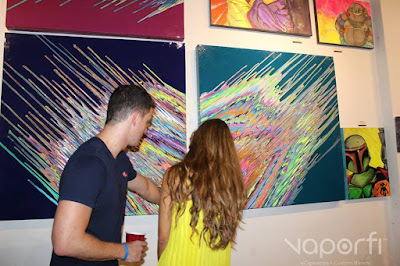 Have Your Art Display In New York City This Summer! It Doesn't Matter If You're From New York City Or Not, This Is Your Chance To Have Your Art Displayed On Advertising Space In The Largest City In America! All Artists Nationwide Are Encouraged To Submit! Be a part of the transformation of advertisements in to public art by and for local communities. We can't do it alone and we need your help! The average donation is $19, that means for less than a dollar a day you can support public art in your local community free of corporate influence or art world classism. Accessible public art produces more public and social good. Fabien Castanier Gallery is excited to announce a very special event at their new space in Miami’s Wynwood Arts District with a solo exhibition for Speedy Graphito. 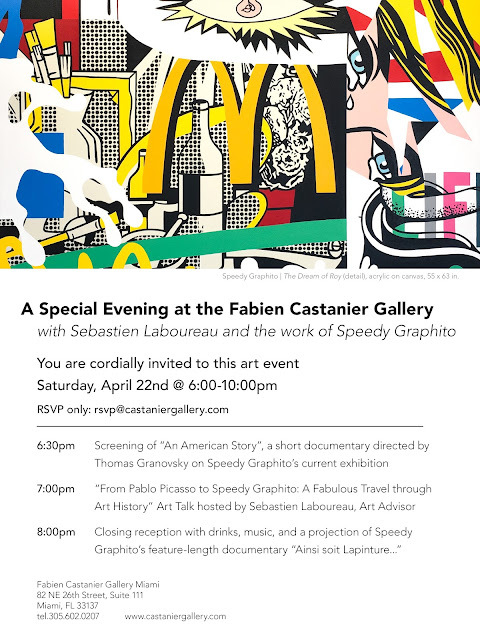 Join us for the Opening Reception on Saturday, April 22nd from 6-10pm. 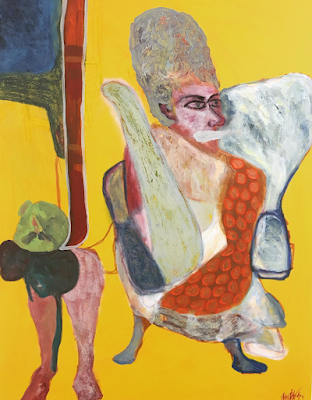 The exhibition, An American Story, will feature new paintings from the artist who has spent the last few months in residence in his Miami studio. 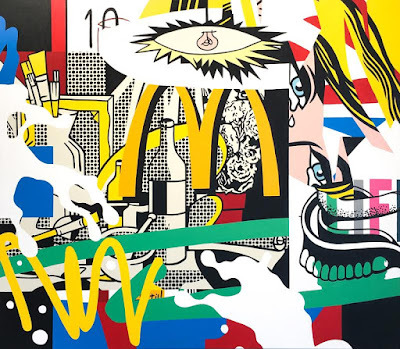 Speedy Graphito’s ‘Happenstance’, 55 x 63 inches. Speedy Graphito’s artistic universe has always been built on an honest dialogue concerning the role of the image within modern society. Since the inception of his career in the 1980’s, his work has dealt with concepts of commercialism, iconography, and pop culture. His new series of work, what he refers to as “mon histoire de l’art” (or “my art history”), confronts our consumerist society and the omnipresence of images and globalization of culture. 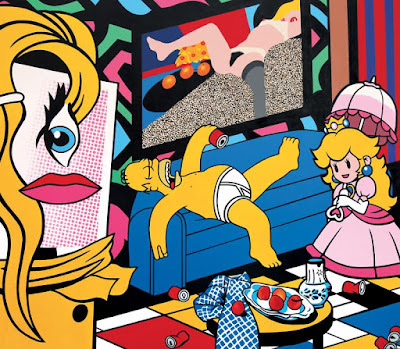 Speedy Graphito’s ‘The Dream of Roy’, 55 x 63 inches. 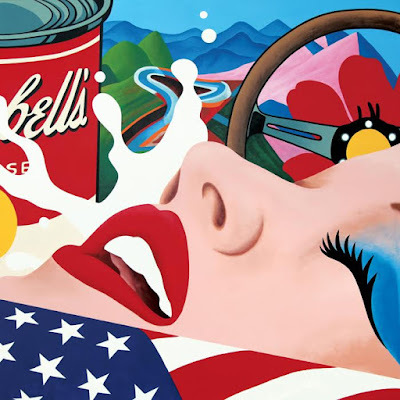 His work for An American Story references motifs and themes from some of the most recognizable painters in art history, from Van Gogh and Matisse, to Andy Warhol and Tom Wesselman. Juxtaposed alongside his own style, the mixture of modern and contemporary masters stands to question the role of art and its legacy through a shifted perspective. 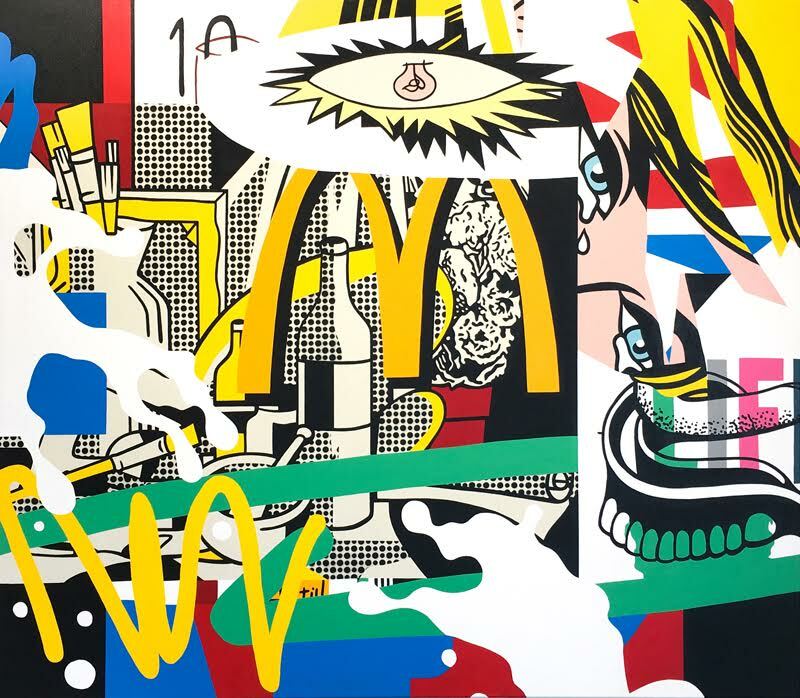 Speedy Graphito, a student of the renowned School of Art Estienne, has since cemented his place as one of the most influential figures who emerged from the Parisian art scene in the 1980’s. His reputation has steadily grown during his 30 year career, affecting a myriad of artists by laying the foundation of his genre, urban and pop art through the lens of contemporary media culture. 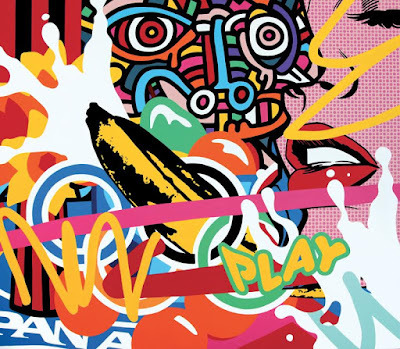 Speedy Graphito’s ‘Play’, 55 x 63 inches. The constant evolution of his work is a testament to the versatility that he brings through his medium. Speedy Graphito juggles between painting, drawing, sculpture, photography, video and performance. And for the past 6 years in the United States, the artist has invigorated the cultural landscape with his tireless commitment to the visual discourse of our generation. Speedy Graphito’s ‘An American Story’, 59 x 59 inches. Celebrating the global impact of Speedy Graphito, the Museum of Le Touquet-Paris-Plage is currently holding the artist’s first museum retrospective, UN ART DE VIVRE. The exhibition employs the entirety of the museum’s Villa Way Side and takes the show back through the artist’s career, from its beginning in the 1980s (where one will find the famous poster la Rué vers l’art or the Lapinture character) to the recent works of the series “mon histoire de l’art”. The museum exhibition will be on view through May 21, 2017. Cuban artist Ulices Alfonso is a Miami-based multidisciplinary artist whose current series of work ‘Abandoned‘ represents the idea of false images of the human being. 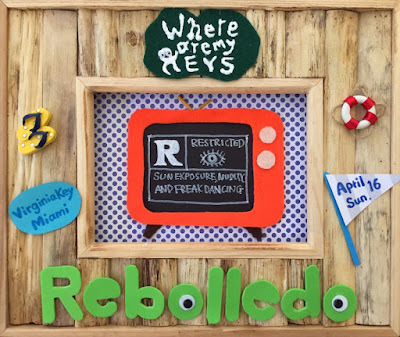 Alfonso’s work was selected to be exhibited this coming May at the Cuban Nostalgia exhibition in Miami, celebrating all things Cuban. 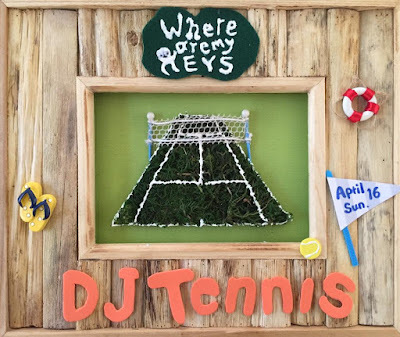 The emerging artist is quickly making a name for himself, he is definitely an up-and-coming artist to keep your eyes on. 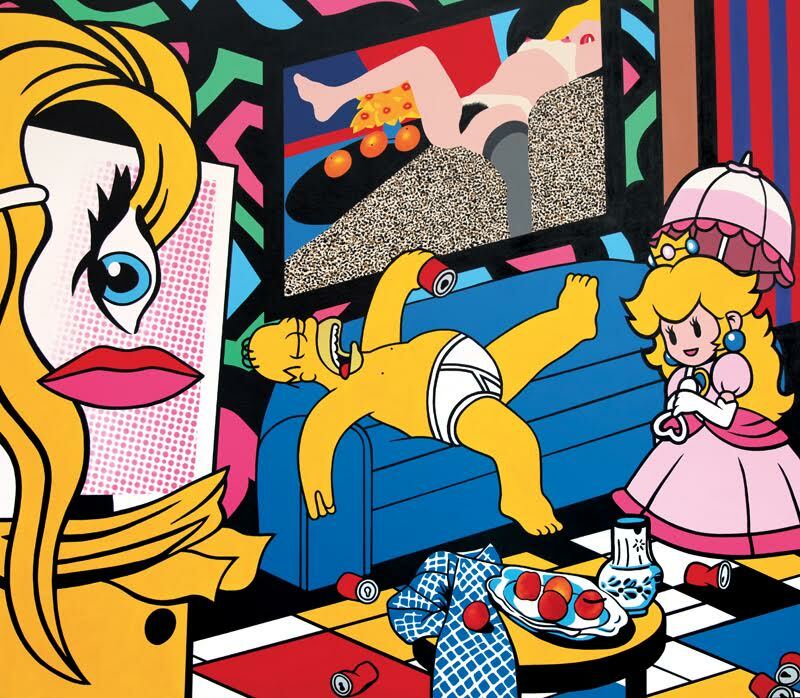 His work is meaningful and unique, offering a deeper understanding of life with references to disfuntional families, human fears and duplistic personalities. There is an interesting quality in his work, which implies our ability to be phony at times yet believing that we are saints when in fact we are only human and very much flawed. 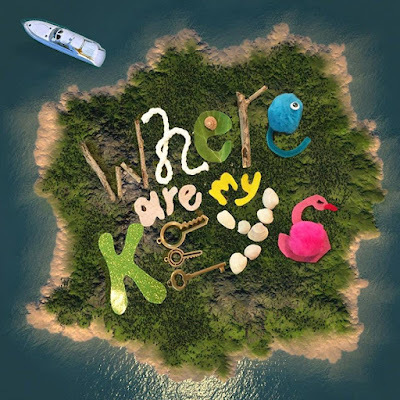 Alfsonso believes we are the product of a connection to many fears, always digging to find something that is missing or forgotten in our life, something ambiguous from our past perhaps. He is the winner of a recent art competition with Interior Ink, which specializes in custom printed interior décor for bespoke applications in the architectural, commercial, and residential design communities. Alfonso’s work will be featured in New York City through Interior Ink’s summer trade show. 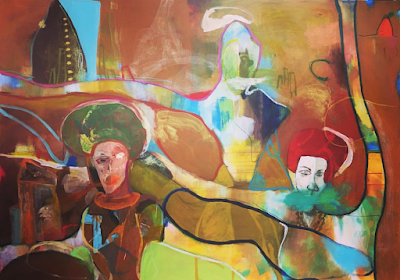 A figurative painter with a philosophical and esoteric approach to art, Alfonso’s work focuses on colorful, enigmatic characters who come together as a tribe of unidealized figures defying objectification. 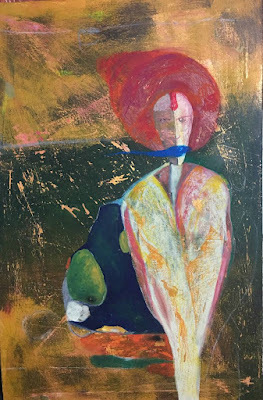 To learn more about this fascinating artist or to commission a piece, email the artist at ulicesalfonso.cubanartist@gmail.com / or to view more work and info visit here. Miami, Where Are My Keys? 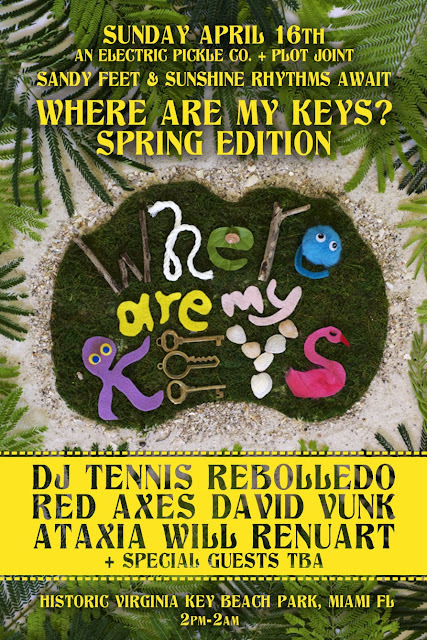 Experience a unique music event on the sands of Historic Virginia Key Beach when The Electric Pickle Company in partnership with Carlos Llanos and PL0T present Where Are My Keys? What began as a remote two-day event during Art Basel 2016, is now being brought back for the second time to a scenic, lush, secluded area of Virginia Key, where music lovers will have the opportunity to congregate in an undiscovered corner of old Miami, while enjoying the sounds of today’s most innovative DJs. 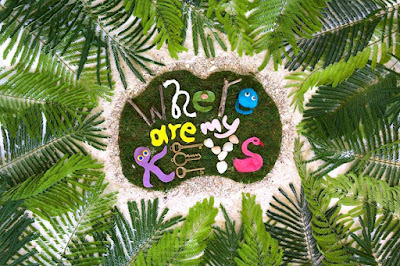 The impressive lineup for this edition of ‘Where Are My Keys?’ includes Kompakt-frequenter Rebolledo, Life and Death mastermind DJ Tennis, psychedelic-electronic act Red Axes and more. Yes, the music will be lively, trippy and unforgettable! 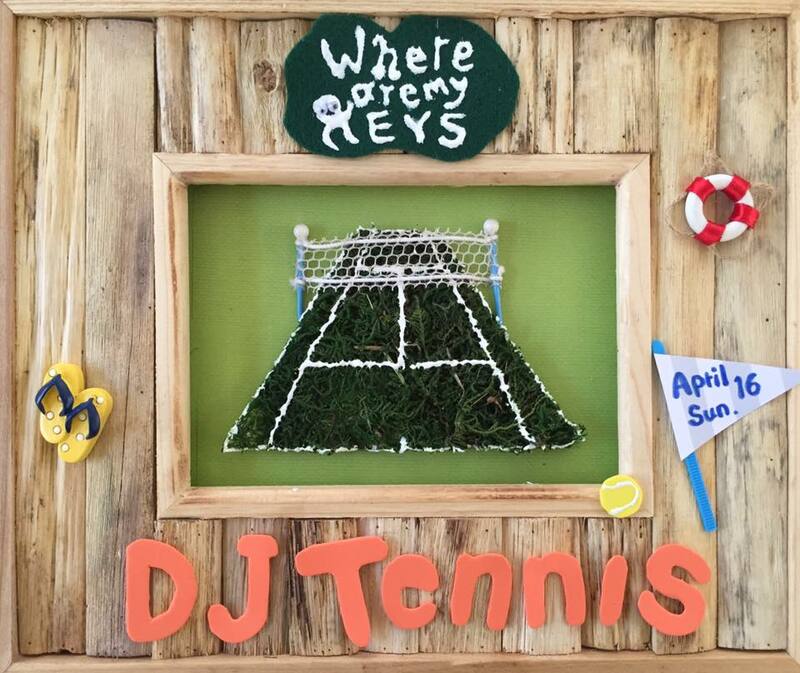 Upon arriving on Sunday, guests will immediately be welcomed by infectious music and the vibrant colors of the Virginia Key scenery. For 12 hours, 3 artists will take guests on a musical journey, with no set restrictions – just an open dance floor in the warm sand. Get your tickets here. Since opening their doors in 2008, the Electric Pickle has become Miami’s premier boutique music venue. Notorious for pushing boundaries with forward-thinking artists, the unique nightclub has earned its name as one of the ‘Top 10 Nightclubs in the US’ by Rolling Stone Magazine, as well as ‘Top 25 Nightclubs in the World’ by Resident Advisor. For more than 10 years, PL0T has been a major contributor to the underground dance music scene in Miami, promoting events in the city’s best venues, debuting and nurturing a number of international acts in the area – including: Seth Troxler, Mano Le Tough, DJ Tennis, Job Jobse, and Bob Moses to name a few. Promoters at heart; driven by a passion to divulge music, moved by the need to create experiences that have long lasting impact on people’s lived memories. Experience Chocolate and Art Show Miami at Wynwood Warehouse Project for a two night event of fine art, great music, tasty chocolate and good vibes, benefiting Artists for Trauma (AFT). 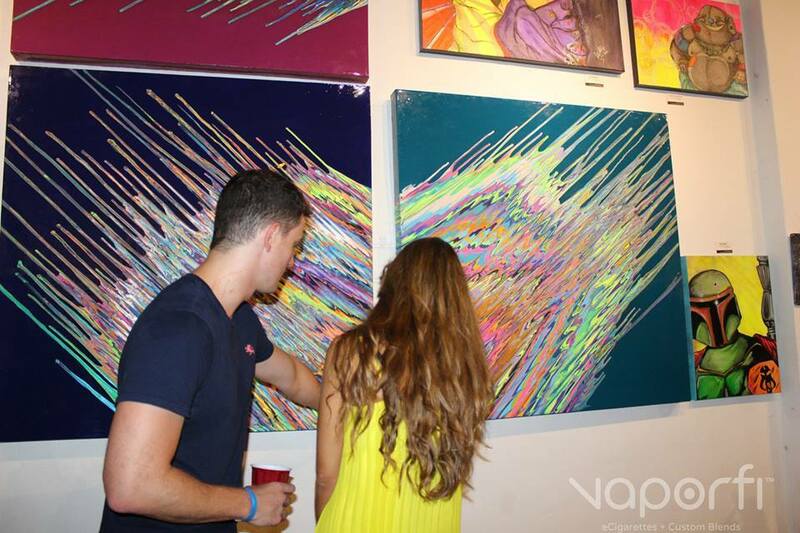 On opening night guest will meet & greet the artists and indulge in some of Miami’s finest up-and-coming fine, contemporary and street artists, photographers and artisans. 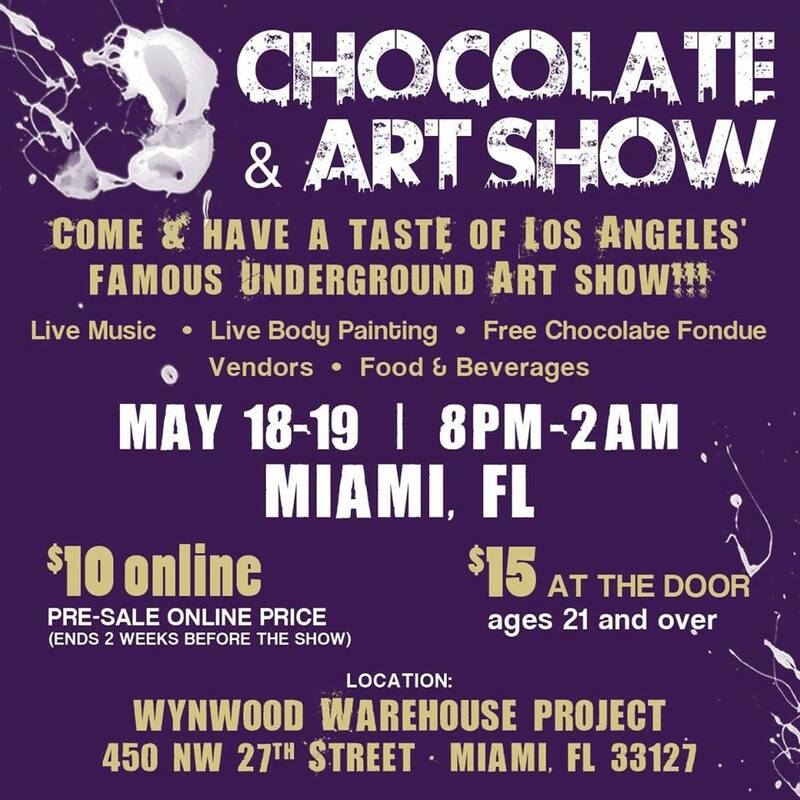 There is something for everybody including live body painting, live music, face-painting, culinary cuisine, artisan vendors and free chocolate. The Chocolate and Art Show is a famous Los Angeles-based art event that contributes to positive social change by building a network of artists of all mediums, collectors and artist enthusiasts celebrating the arts and supporting local business and local art community raising awareness and support for Artists for Trauma – a charity that nurtures and empowers the lives of both civilian and military trauma survivors by pairing recovering patients with established artists from various creative disciplines. 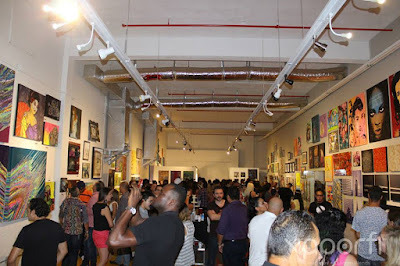 The organization now brings their incredible show to Miami with an exciting lineup of gifted artists and artisans in multiple genres, who are giving back to the community through their art and creative talent. The show has a piece of art to resonate with everyone who enters the event. Outside there will be 5 amazing bands playing throughout the night! And for those foodies out there, enjoy delicious culinary cuisines, while inside mixology bartenders will keep you guessing ingredients all night long, with guest Dj’s dropping huge beats for your entertainment. Free street parking / show is 21+. General Admission Ticket $15 online (or) purchase tickets at the door at $20 each. Dennis DeGraw is a spiritual painter who began developing his painting technique in 2012 shortly after attending the New York Academy of Art. 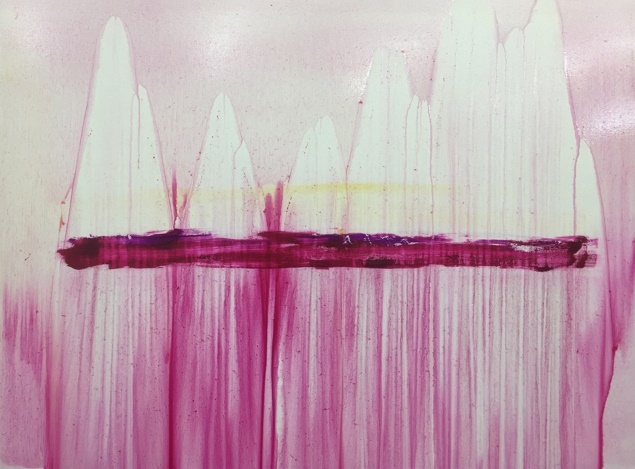 He currently resides in Brooklyn, New York and creates his exquisite abstract paintings from his art studio located in the artsy and historic neighborhood of Gowanus, Brooklyn. 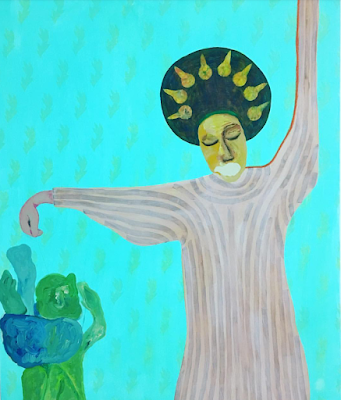 DeGraw is a captivating artist who incorporates personal writings alongside his paintings, introducing viewers to his visual work through a personal expression of words and stories. DeGraw’s work embodies the tenets and style of the Abstract Expressionist movement, his work encompasses not only the work of a painter who fills his canvases with fields of color and abstract forms, but also attacking his canvases with a vigorous gestural expressionism. He is committed to an expressive art of profound emotion and universal themes. The writings he produces are of a meta-physical nature, explaining his visual images in language and providing an extension of the work. 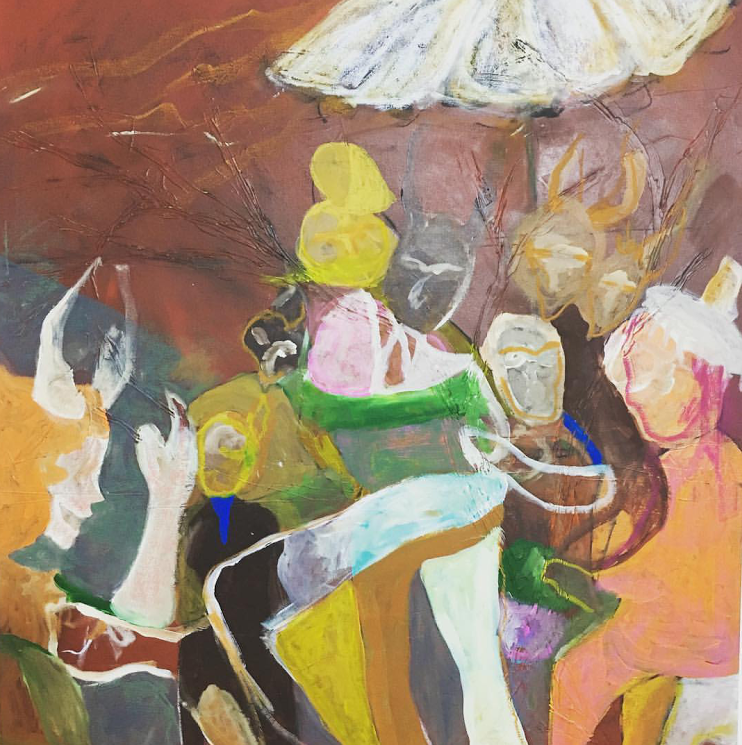 DeGraw offers a secondary value through the “story-telling” of the paintings, giving the viewer a closer connection and understanding. V:II Weight, Be The Void series. 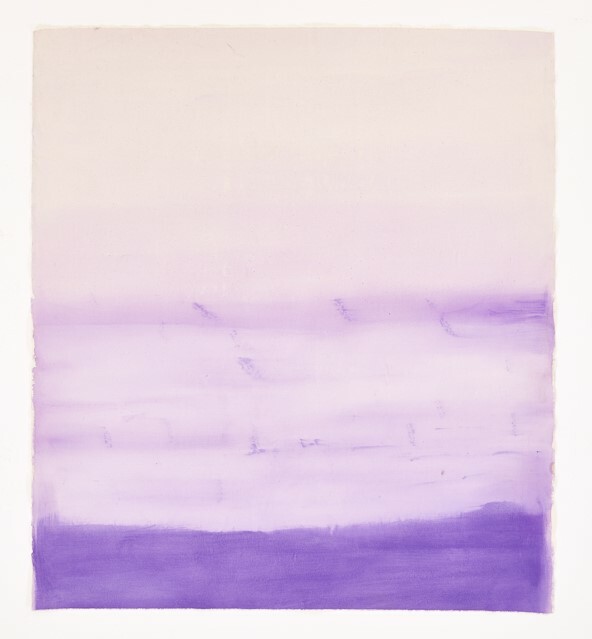 Oil on Canvas, 66″ x 60″, 2012. One of our favorite series of DeGraw’s is Be The Void, created in 2012, based on an abstract submersion into depression, withdrawal and heartache, and the eventual rise of the light within. The artist conveys a sublime landscape of color and form, while introducing his writings, allowing the works to be humanized and understood. DeGraw is cataloging the events and feelings of his life, documenting a timeline of places and emotions through his works, creating a visual and written diary. V:VI Aura, from Be The Void series. Oil on Canvas 60″ x 30″ x 2″ 2012. In 2013, DeGraw created his acclaimed Lifeboat series, where his work visibly emerged into the light and new life sprang forth. 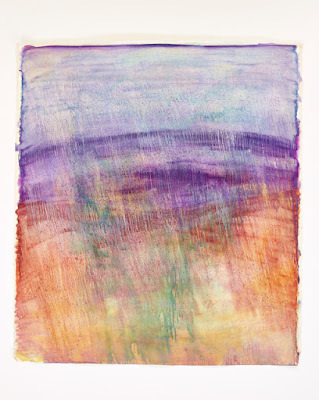 In May 2013, he was inspired to begin a new collection of paintings while visiting with friends in South Carolina. The painting Charleston from this series was created in his dear friend Maxine Chapman’s living room of her home in West Ashley, South Carolina. “2013 was a year of many dimensions. So much was lost. So much was gained. And so much changed. Every emotion hit a peak. Every emotion hit a valley. While travelling all those miles of road along the way, something inside me made my spine stay rigid, my head stay straight, and my vision stay clear. I was forging against the resistance I faced with a sense of self-respect, and through it, creating art.” said DeGraw of this time. “It was not until I unraveled all the paintings on January 1st, 2014 at my new residence in Bushwick, Brooklyn that I realized how much I loved every piece I had created. These paintings are my meditation, and because of this, I feel they are truly magical. I struggled with the decision as to whether to disclose the intimate stories and details that accompany each individual painting. As deeply personal as each painting is, I have decided to add their stories. I am grateful for every experience I have had in the past year. I am also grateful for every person who has entered my life, and for those who have exited it. Most of all, I continue to be grateful to be able to embrace my artwork each and every day. It is my magic. It is my definition. It is my Lifeboat.” -Dennis DeGraw. New work in the studio, 2017. 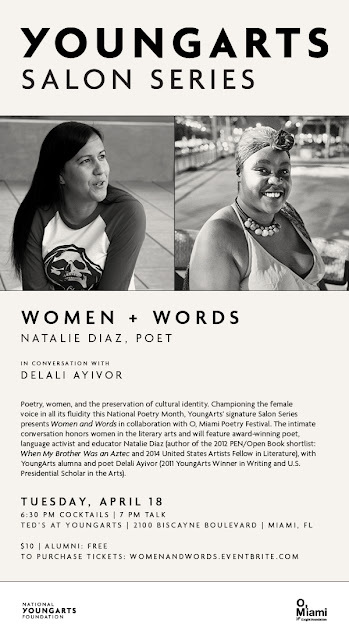 Join us on Tuesday, April 18th at 6:30pm at the one and only YoungArts in Miami for Salon Series, the upcoming event champions the female voice in all its fluidity this National Poetry Month as YoungArts’ signature Salon Series presents Women + Words in collaboration with O, Miami Poetry Festival. The intimate conversation honors women in the literary arts and will feature award-winning poet, language activist and educator Natalie Diaz, with YoungArts alumna and poet Delali Ayivor (2011 YoungArts Winner in Writing and U.S. Presidential Scholar in the Arts). #SAVEARTSPACE brings public art to New York City, showcasing local female artists on advertising spaces throughout the area beginning June 26, 2017. 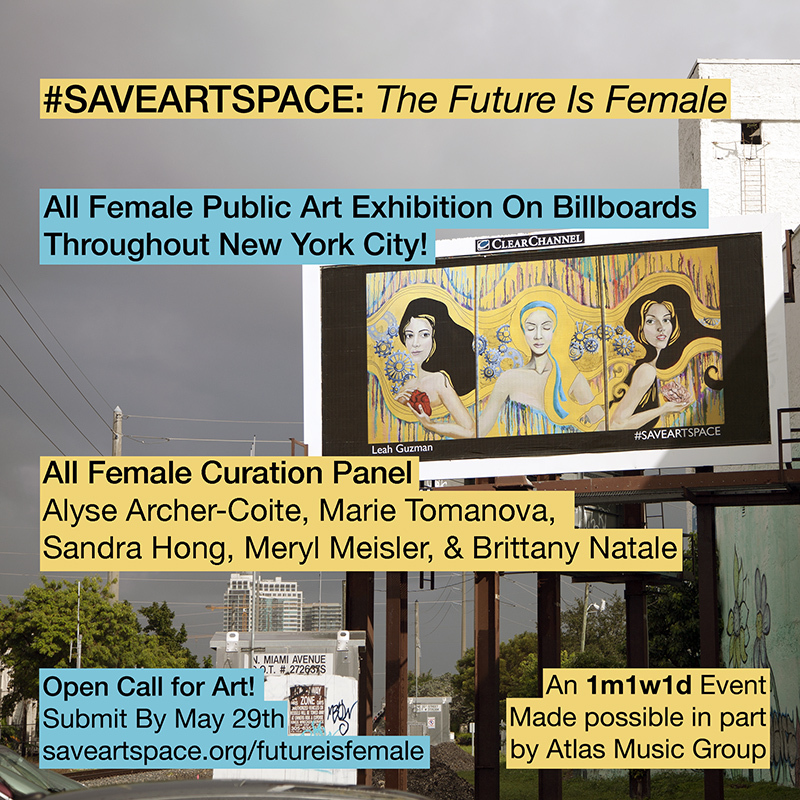 The exhibition is entitled #SAVEARTSPACE: The Future Is Female. As an arts organization, we feel that it is our duty to align and ally with the broader artistic community to create exhibitions that address intersectional concerns which can spread a message of progressive and positive social change and empowerment. The All Female Curation Panel will consider each submission's pertinence to the theme of the exhibition, the context of the images and association to the public space. The curators are Alyse Archer-Coite, Marie Tomanova, Sandra Hong, Meryl Meisler, & Brittany Natale. All submissions will be featured on saveartspace.org and on #SAVEARTSPACE social media pages with the permission of the artist. The complete list of rules for submissions can be found here. 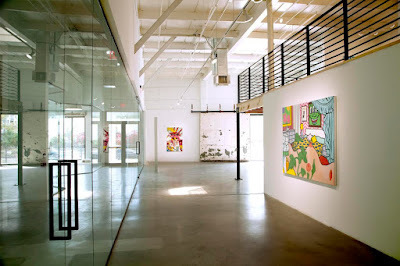 #SAVEARTSPACE has held previous Public Art Exhibitions in New York City, Los Angeles, and Miami, Fl. 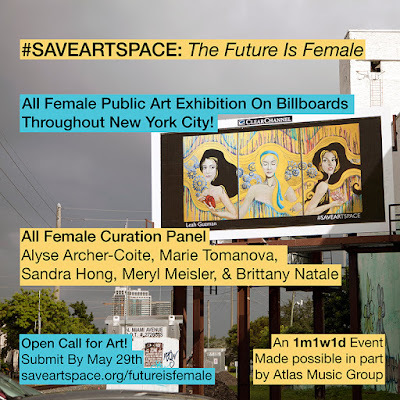 #SAVEARTSPACE: The Future Is Female is An 1m1w1d Event. Made possible in part by Atlas Music Group. #SAVEARTSPACE transforms advertisement space into public art by and for the local community. 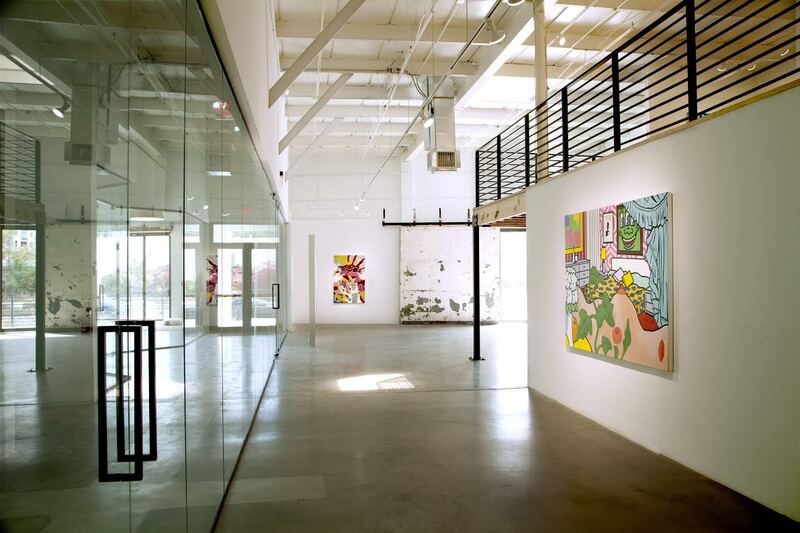 Providing artists opportunities to display their work in the public space. 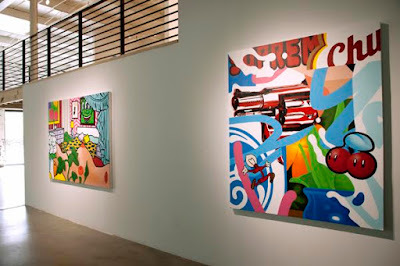 Creating an urban gallery experience, we aim to affect and inspire and new generation of artists. One Month One Week One Day, aka 1m1w1d, is a multi-disciplinary arts organization that seeks sponsorships for monthly events from the advertising industry in order to fund artistic endeavors that benefit the greater community, including an annual $10,000 Artists Grant.